For Children With Autism, A Museum Can Be A Scary Place : Shots - Health News A day at a museum promises fun for parents and kids alike. But for children who are on the autism spectrum, a seemingly simple museum exhibit may be too overwhelming to enjoy. Now, museums are coming up with ways to accommodate these visitors. 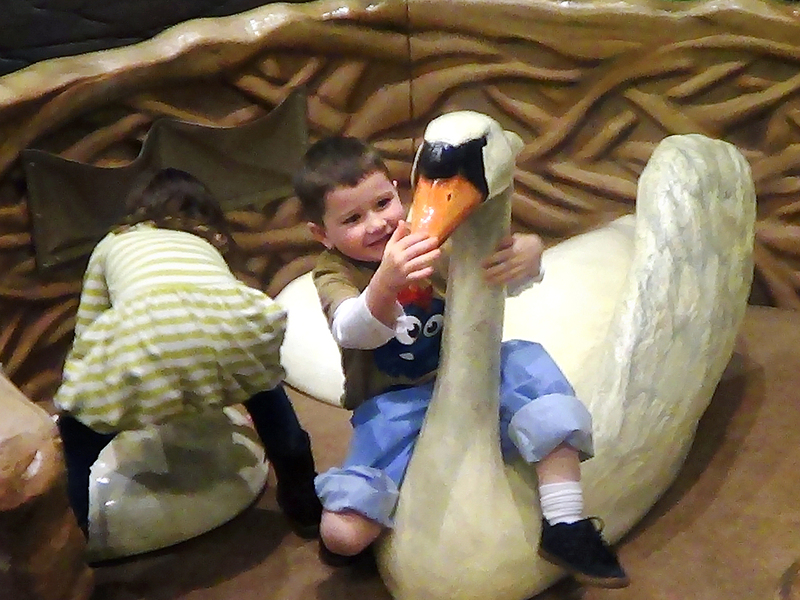 Dylan Murphy, 3, plays with a swan at the Please Touch Museum in Philadelphia. It was his first trip to a museum that didn't overwhelm him. Last January, Noelle Murphy and her family were on their way to the Please Touch Museum for children in Philadelphia. Right before they arrived, 3-year-old Dylan had an accident. "He wet himself," Murphy said, "And we were thinking, 'Oh no, how are we going to deal with this?' "
Dylan has autism, and his mom, Noelle, tends to choose at-home activities over unpredictable outings like a day at the museum. If Dylan becomes overwhelmed by his surroundings, he might yell loudly, or drop to the floor and refuse to get up. For Noelle, that's not out of the ordinary. But when strangers around them are added to the mix, it can make for an embarrassing scene. But that day at the museum was different for the Murphys. They took advantage of Play without Boundaries -- an hour of museum time for kids with special needs. No weirdness, no awkward explanations, just families with other families who understand the challenges of being in public with kids who are on the autism spectrum. "When we got there, they had a pair of hospital scrubs in his size, they took his dirty pants and washed them," Murphy said. "It was an extremely different experience than what we are used to." A study released Monday by the American Alliance of Museums finds more and more of these centers for learning and preservation are also places where health awareness is on display. The Please Touch Museum is one of over 30 museums in the U.S. that has responded to the special needs of visitors with autism. "My first reaction in the car on the way home was to cry," Murphy said. "My husband asked why I was crying, and I said it was so nice to finally take him somewhere other kids go without having to worry about an unpleasant experience ... for us and those around us." But it's not always easy to take a kid with autism out into the world, especially a museum. A recent tally found that 1 in 88 children in the U.S. is somewhere on the autism spectrum. For these youngsters, if a place doesn't have appropriate accommodations, museum-going is a no-go for much of their childhood. That's because so often, what seems like a fun diversion ends up causing feelings of anxiety and sometimes panic. That's why some museums have made special accommodations. "During those hours the museum looks different," said Leslie Walker, Please Touch Museum's vice president for community learning. Flashing lights are dimmed, and booming music is turned down. Kids who want a sense of security about their visit are encouraged to create custom schedules and maps beforehand. And museum employees who will teach kids about the exhibits go through sensitivity training to learn what needs a child with autism might have to interact like their peers. "They know now to bend down and get on that kid's level, and to wait awhile before following up if they ask a question," Walker said. At museums that acknowledge not every kid craves raucous, stimulating sights to have a good time, parents of children with autism find public places where they can be themselves. And they don't have to miss out on experiencing another childhood pastime with their kids, like getting lost in a museum.